Geofences - what are they and how do they work? A geofence will require use of our smartphone apps. In Buddy Punch a geofence is a radius around a physical location that limits where your employees can punch in and out from. If your employee is assigned a geofence, they must punch in and out from that geofence. An employee can be assigned multiple geofences and can punch in and out of any of them that they are assigned. You will first name the Geofence. This name will be visible to the employee when they are punching in and out of the fence. The next is the address where you would like the radius to be around. You can optionally type in a latitude and longitude. You will then select a radius from around the location. We have 5 options for the radius. Keep in mind you can create multiple geofences, if you need to encompass a larger area. 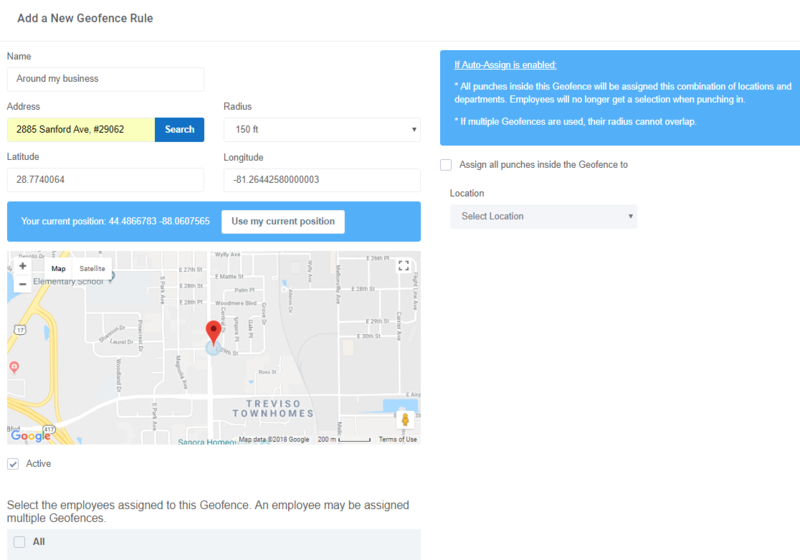 You then have the option to automatically assign a specific Location, or Location/Department Code combination when an employee is punching in this geofence. 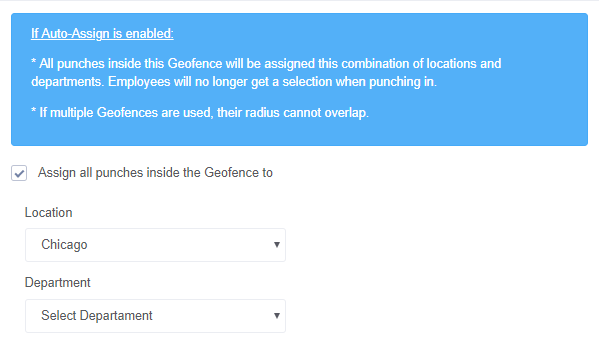 If you would like the employee to select from a list of departments when using the geofence, leave the Department option blank when setting up the fence. They'll then have to select from any Department Codes they are assigned. If you do not use the auto-assign option then employees will still be able to select from any Locations/Departments they are assigned when punching in. Then select from your list of employees you would like to use this geofence and save. You will now see the list of geofences you created. Your employees can still login from anywhere. A geofence will restrict punching in and out. Your employees will still need to punch in and out when they're in the geofence. We do not automatically punch employees in and out when they enter or leave. Geofences require the use of our smartphone apps. However if you would like to use geofences along with desktop users, geofences will work with IP Locks. As long as your employees are assigned both a geofence and an IP Lock, they can use either one. Geofences require a GPS signal from our smartphone apps. A web browser cannot be used to punch in/out from a mobile, laptop, or desktop device.